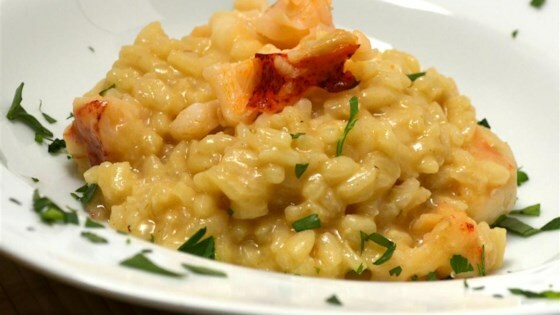 "A very rich and creamy risotto with lobster, caramelized onions, and sherry." Heat 2 tablespoons oil in a large skillet over medium heat; cook and stir onions until light brown and tender, about 20 minutes. Bring chicken broth to a boil in a pot; reduce heat to low and keep at a simmer. Heat remaining 2 tablespoons oil in a large, flat-bottom pan over medium-high heat. Cook and stir shallot and garlic in the hot oil until fragrant, about 2 minutes. Add Arborio rice to shallot mixture; cook and stir until rice begins to brown, about 3 minutes. Add wine and cook for 1 minute. Stir 1 cup chicken broth into rice mixture; cook, stirring constantly, until broth is absorbed. Repeat adding broth, 1 cup at a time, until all the broth is used, stirring constantly until broth is absorbed each time, about 30 minutes. Mix honey into onions and cook 5 minutes more. Stir butter into rice mixture until melted. Add cream and stir until rice mixture thickens, about 3 minutes. Add paprika and cayenne pepper; stir well. Add sherry and mix well. Stir lobster meat into rice mixture and cook until heated through, about 3 minutes. Mix Parmesan cheese into rice mixture until melted. Add onion mixture and mix well; season with salt and pepper.